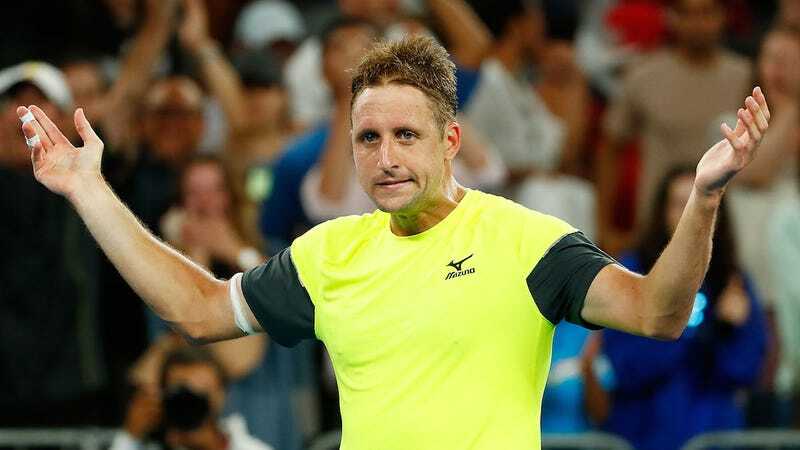 American tennis player Tennys Sandgren, Pizzagate truther and guy who said America can’t be racist because it elected a black president, thinks the alt-right has some “interesting” ideas. This came to light at the Australian Open during today’s post-match presser when a reporter asked Sandgren about his social media activity, in which he has argued about Pizzagate, agreed with Mike Cernovich about “fake news,” and wondered why mainstream media wasn’t covering “spirit cooking,” an alleged satanic ritual that Hillary Clinton supposedly took part in. Recently, Sandgren’s Twitter activity included retweeting Nicholas Fuentes, a toady teen white nationalist who last year went to the Charlottesville rally to march alongside Nazis and Klansmen. Sandgren: Is that linking? Is that linking? Sandgren: Debated? That’s interesting, ok.
Reporter: Yeah, there was a #pizzagate exchange at some point, and I just wondered if you were concerned about having yourself connected to some of these controversial figures. Sandgren: I mean, no, I’m not concerned about it. Sandgren: It’s fine, it’s fine. I don’t, look—who you follow on Twitter, I feel like doesn’t matter even a little bit. What information you see doesn’t dictate what you think or believe and I think it’s crazy to think that, I think it’s crazy to assume that, to say, “Well he’s following X person so he believes all the things that this person believes.” I think that’s ridiculous. I think that’s ridiculous. That’s not how information works. If you watch a news channel you wouldn’t then say that that person who’s watching a news channel thinks everything that that news channel puts out. You wouldn’t think that. And no, I don’t think—I’m not concerned about it, and I don’t think that any kind of engagement in that way dictates that you then are right in there with that particular person. I don’t think it works that way and I don’t see it as working that way. I mean, you can ask me about my beliefs on things, that’s cool. But I think to lump in, just say, “Well you follow this person,” so then, wow who are you? It’s like, ask me, you can ask me who I am and I’m perfectly fine answering those kinds of questions. Reporter: Do you feel that you support some of the alt-right movement? Sandgren: No, I don’t. I find some of the content interesting, but no I don’t. Not at all. No, as a firm Christian, I don’t support things like that, no. I support Christ and following him and that’s what I support. The reporter really let Sandgren off easy, because he doesn’t actually address the thoughts he has espoused in his own words. Following an alt-right goblin doesn’t mean Sandgren believes what they do—not everyone who follows Donald Trump on Twitter voted for Donald Trump, for example—but when he says Pizzagate is “sickening and the collective evidence is too much to ignore,” or that he believes that the mainstream media isn’t covering Hillary’s involvement in Satanic rituals because “they are concocting a way to make it sound not so bad,” yes, any reasonable person would see those as endorsements. Fuentes has already glommed on to being mentioned, and called Sandgren a friend.